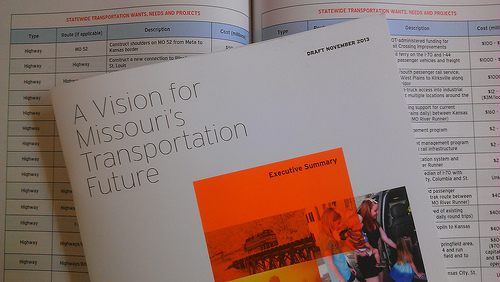 On November 18, MoDOT called its regional planning partners to Jeff City to lay out the process for developing a list of projects that would accompany a transportation funding question that could be on the November, 2014, ballot. That question — should it clear the necessary hurdles either through the initiative petition process or by act of the 2014 General Assembly — would ask Missouri voters to approve a one-cent increase in the state sales tax for a period of ten years, producing a total of about $8 billion. The project list would let voters see what they’d be getting. It’s all about accountability, and accountability is good. Based on a briefing by MoDOT and MARC staff at the November 19 meeting of MARC’s Total Transportation Policy Committee, it appears that a lot less is set in stone than we had expected. Moreover, indications are that MoDOT is willing to have the project list include just about anything — anything transportation-related, of course. A tentative spending plan circulated by MoDOT earlier this year had well over $1 billion coming off the top for reconstruction of the 200 rural miles of I-70 as a six-lane freeway. That is no longer a given. Even the idea of building six lanes all the way is apparently no longer to be taken for granted. That shift in itself is real progress. Under MoDOT’s plan, its regional planning partners — Metropolitan Planning Organizations like Mid-America Regional Council in Kansas City and East-West Gateway Coordinating Council in St. Louis, plus Regional Planning Councils throughout the rest of the state — will develop their priority lists between now and next June. – A slice for I-70, as has previously been discussed? – A slice for public transit, to be divided among the state’s dozen or so transit providers? – A slice to assure funding for the Missouri River Runner passenger trains between Kansas City and St. Louis. – Maybe even a slice for some hypothetical “challenge grant” programs to help local communities do long-needed smaller projects? Whatever off-the-top slices there might be for statewide needs and programs, there would also be an allocation to each of MoDOT’s seven districts for projects to be decided in consultation with MPO’s and RPC’s. Sound complicated? Well, it probably is, and we have a hunch that even MoDOT’s top staff don’t know yet how it’s going to play out. What we do know is that we’ve never before seen a proposed spending program that is so open to public involvement and input. Throughout the site you’ll find opportunities to click on an orange box and let MoDOT know what you think. Do it! A final note. We’ve noted before that there are reasons to be concerned about passing a sales tax for transportation and nothing else, while highway user fees are among the lowest in the nation. Perhaps legislators will take that concern seriously in January and devise a revenue package that gives MoDOT enough to keep it going while also meeting other important state investment needs. Meanwhile, it’s important that we play along while we press MoDOT and its planning partners to devise as progressive and inclusive a transportation investment program as possible. This entry was posted on November 21, 2013 at 8:52 AM	and is filed under Action, Regional Transit Issue. Tagged: MARC, Missouri. You can follow any responses to this entry through the RSS 2.0 feed. You can leave a response, or trackback from your own site.